I recently visited Russound up in Newmarket, New Hampshire, a bucolic community of less than 9,000 residents that is rich in history – it was established in 1727 – and situated near the University of New Hampshire in Durham. The town’s rich history is an allegory for Russound itself, a company that is also rich in history – established in 1967 – but finds itself streaming into the future. As part of my visit, the company gave me a sneak peek at what it is showing at ISE in Amsterdam this week. During my visit to Russound, I was shown a video the company had created to celebrate its then 40th anniversary, some 12-years ago. The video showed a lot of old pictures of the early days of the company, including their early products (like volume controls), and was narrated by owner Maureen Baldwin over a soundtrack of some great music from the day…and who told many heart-warming stories about those early days and what the company has become. Clearly, a company that wound its own coils for volume controls and sought to get those volume controls UL-approved (who…does…that? 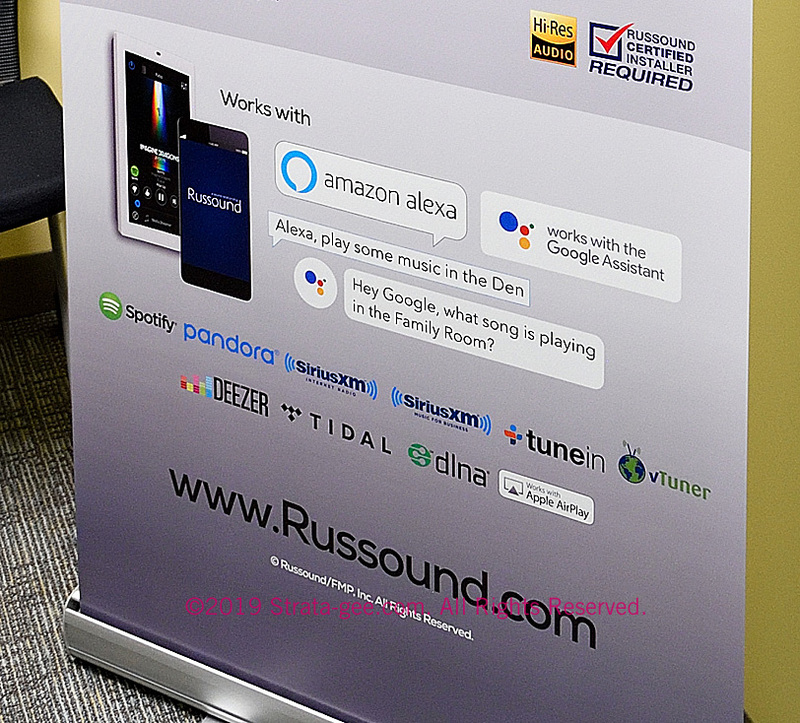 ), Russound is a company long committed to product quality. That mentality has carried them to to this day, although certainly the industry and the world have change much since then. Operating Standards Attributes, Are They Honest? That Mission Statement closely tracks the company’s historical philosophies as expressed in the video I reviewed (but did not independently verify) on the company’s history. Winding their own volume control coils? Paying for UL approval of a low voltage control? Who…does…that? In addition to this Mission Statement, the company says that its Operating Standards are: Honest, Responsive, Positive, Consistent, Accountable, and Loyal. Had I just heard them say this, I would question just how genuine the feelings expressed by those attributes truly are. But after hearing owner Baldwin talk about being a flower child of the 60s who just happened to love manufacturing – and speaking with various business partners of the company – I’m inclined to give it some credibility. Why, for example, would a company spend money on Underwriters Laborator (UL) approval for a volume control, when such approval is designed more for high-voltage electrical safety standards, rather than low-voltage operating standards. However, if you want external, authoritative confirmation that a product is well-built and safe, then you might spend the money to do that. That’s a pretty “hippie” concept. 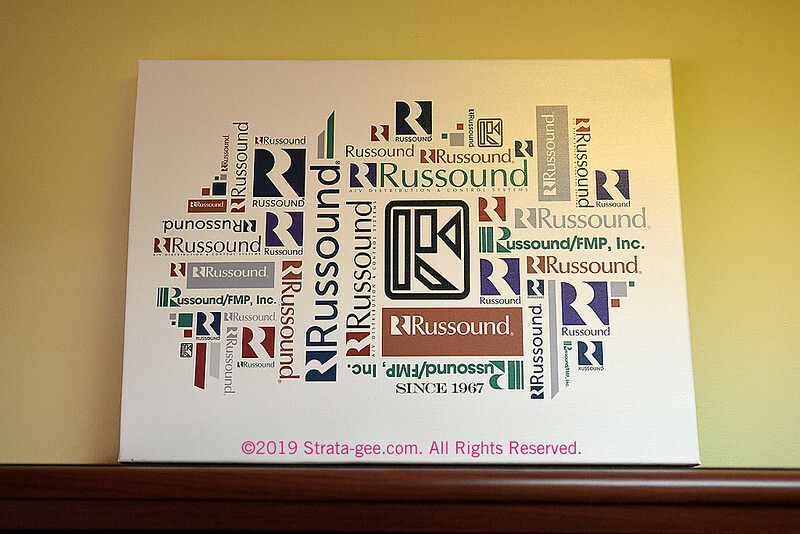 At CEDIA Expo 2018, Russound surprised me with a completely redesigned loudspeaker line and a new generation of Wi-Fi streaming preamp and amplifier products. 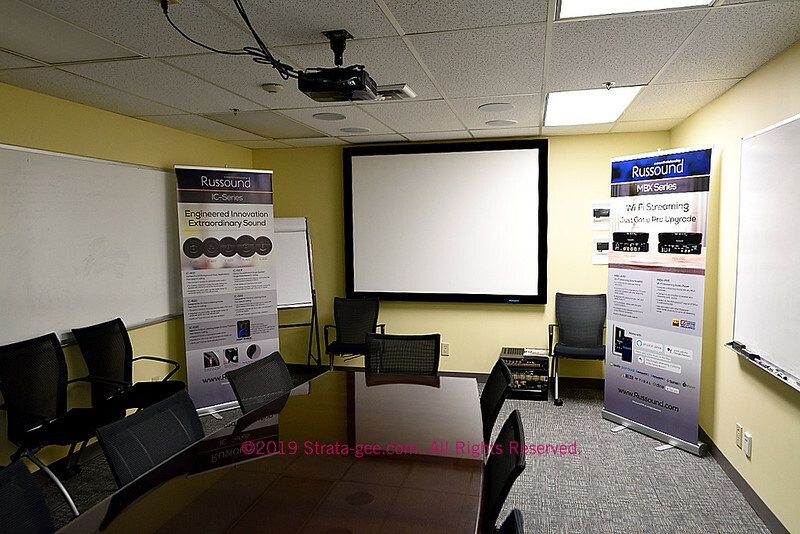 Russound has been an early adopter of streaming solutions and this new generation of products looks and sounds great. But let’s start with a review of their new speaker assortment. Russound COO and VP of Products Colin Clark said that this new line was re-conceived from bottom to top. All elements of assortment configuration were considered to yield a line with powerful feature sets, at high value price points, and logical steps up and down the line. This line, they maintain, just makes sense, more so than the previous one…and perhaps as compared to others. 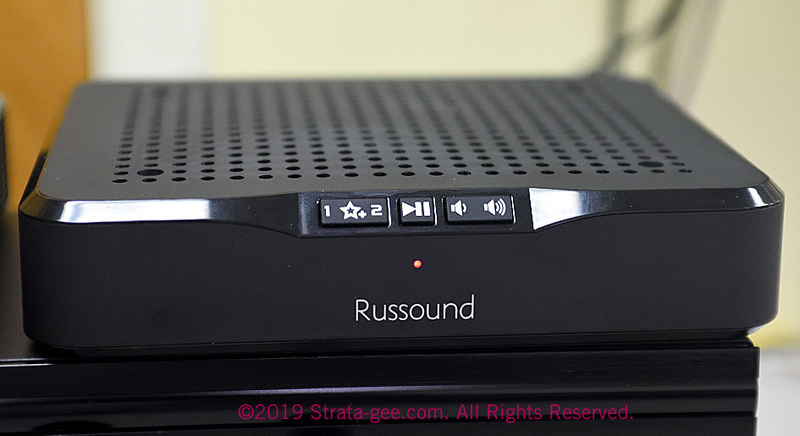 Russound IC-820 – You can see their SwiftLock tool-less installation mechanism in which you simply press a button and the spring-loaded mounting dogs clamp down on the wallboard. Note also that there are only three dogs as compared to the four that many others use. This is all designed to deliver a faster installation. There are three series, or performance grades, of products – the ’10’ series, the ’20’ series, and the ’30’ series. The 20 series is available in two different sizes – 6″ and 8”. There is also a twin-tweeter/dual voice-coil woofer model for single-point stereo, and a new in-wall model for an overall fairly complete assortment. So in other words you have the IC-610, -620, -630 (good/better/best) with 6.5″ woofer, an IC-610T (twin tweeter & dual voice-coil woofer) model with a 6.5″ woofer, and an IC-820 primary listening grade speaker with an 8″ woofer. And finally, there is the IW-620 in-wall model with a 6″ woofer. 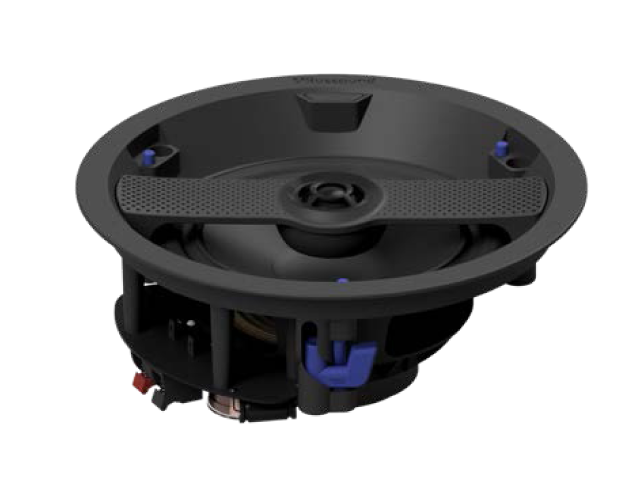 As far as innovations, the company points to a new one-piece integrated baffle and speaker basket construction on all speakers. Russound CEO Charlie Porritt said they like to call it a “unibody construction.” This is said to give greater rigidity and better performance than the more common multi-piece construction. Maybe, but aluminum or other metal baskets have served the industry well for many years…so we’ll have to experiment with this new unibody design a little to see if it is as tough and long-lasting. But the really interesting technology that Russound is using is their SwiftLock by Swarm tool-less installation technology. 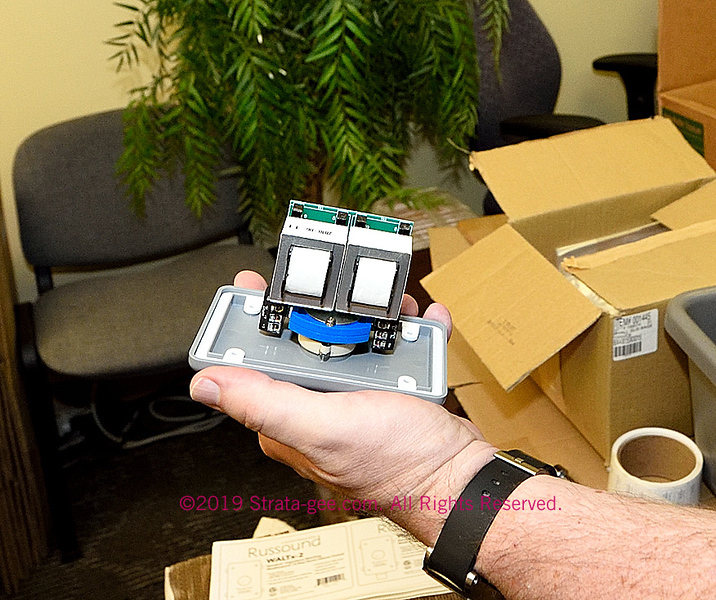 With SwiftLock, you position the speaker in the opening and then simply press a blue button which activates a spring mechanism…literally springing the mounting dogs into clamping the wallboard. It’s fast, efficient, and seemingly effective at clamping the speaker to the wallboard. SwiftLock is available in the 20 and 30 series models. 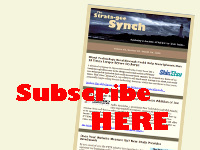 Longtime Strata-gee readers know that I am a skeptic on the many dramatic claims for tool-less installation technologies. When Origin Acoustics made a lot of noise about their two-piece solution, I found it not much more elegant than simply using a power drill to drive mounting dogs into place. But I have had some integrators suggest such systems are helpful. To my eyes, this system from Russound seems a quicker and easier way to go if tool-less speaker installations are your thing. So the new Russound speaker line-up looks good. But…how do they sound? I always enjoy a good demo, so when Colin Clark asked if I would like to audition their speakers, I jumped at the opportunity. 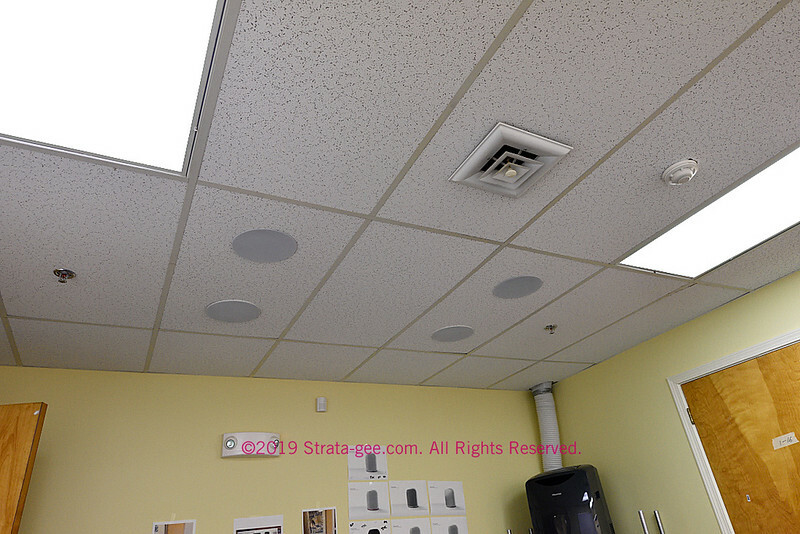 As you can see in the image above, Russound set up two pairs of speakers in their ceiling. One set was their new IC-610 entry-level architectural speakers. The IC-610’s have an MSRP of $159/pr. The other set was a pair of comparable Proficient speakers, the C606, which according to Clark, carries an MSRP of $215/pr. Clark cranked up the MBX-Amp and selected a few different musical selections…starting on the Proficients. This browsing and selection of a music source on the MBX-Amp was very quick and easy for him to do utilizing the Russound app. The Proficients sounded really quite competent when listened to on their own, I really had no major complaint. They were a touch thin, with not much stereo imaging to speak of, but, hey, these are entry level models. Clark switched to an Adele recording which had high production values with a rich full tone and, of course, Adele’s wonderful voice. When Clark switched to the Russound IC-610s, my eyes widened and jaw dropped (a little), completely betraying any hint of my professional, stern reviewer poker face. In fact, the difference was so pronounced, I had to ask if there were any potential funny issues involved – such as wiring one pair out of phase, or stuffing material behind one or more woofers, etc. The Russound executives swore to me there was no funny business. It was an up-and-up fair comparison. What I heard was the soundstage open up…dramatically so…on the 610s. The tone was full, rich, but well-articulated…and much, much cleaner than I would have expected for this model designed for non-critical background music listening. The comparison was stark. They did NOT sound like entry-level speakers. Without conducting my own tests in a more controlled (by me) environment, I’m going to reserve any more superlatives. But it is safe to say that, based on these circumstances, I was impressed with the sound of the IC-610s as compared to the Proficient C606. Another demo had also been set up for me to compare the Russound IC-630 ($499/pr) versus the Proficient C641 ($475/pr). This demonstration I cut off almost immediately, because there was something obviously wrong…some kind of undiagnosed installation issue. Neither of these models sounded particularly good to me, and that just couldn’t be right given the enhanced quality and performance level of both of these models. Unfortunately, we didn’t have the time to troubleshoot the installation, as my time to depart was rapidly approaching that day. So we’ll call that particular contest a push at this point. This was unfortunate, because after being so impressed with the entry level IC-610, I was really curious to see how the higher-end models sounded. But that’s how it goes with demos, sometimes they’re great…and other times, the gods just aren’t with you. I recommend you give Russound’s IC-610 a listen and decide for yourself. 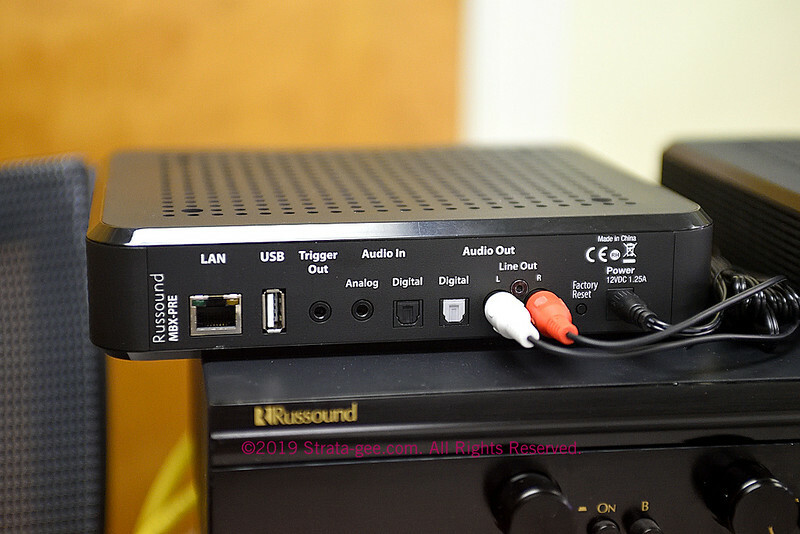 Russound was one of the first brands to really embrace streaming systems and this latest line benefits from their many years of experience. Called the MBX Series, there are two models: the MBX-PRE and the MBX-AMP. One is a preamplifier-based model for use with a controller or external amplifiers, and the other includes built-in power amplification. This shot of the MBX-Pre back panel shows the tremendous flexibility that Russound has built into it. While it is designed to easily connect with Russound’s MCA Series Controllers, it has wide connectivity solutions for a variety of systems. While it might be a wireless wonder, note the LAN connection to easily connect with a hard wired connection. The USB port gives you access to music files on flash drives or USB memory sticks. And of course plenty of inputs and outputs, both digital and analog. The MBX-Amp features all the connectivity of the MBX-Pre with an IR input and a subwoofer output added. A 2.1 configuration, the MBX-Amp offers 50 watts/ch of power – plenty enough for most installations. Need more power? Use the outputs to connect to a larger external amplifier. 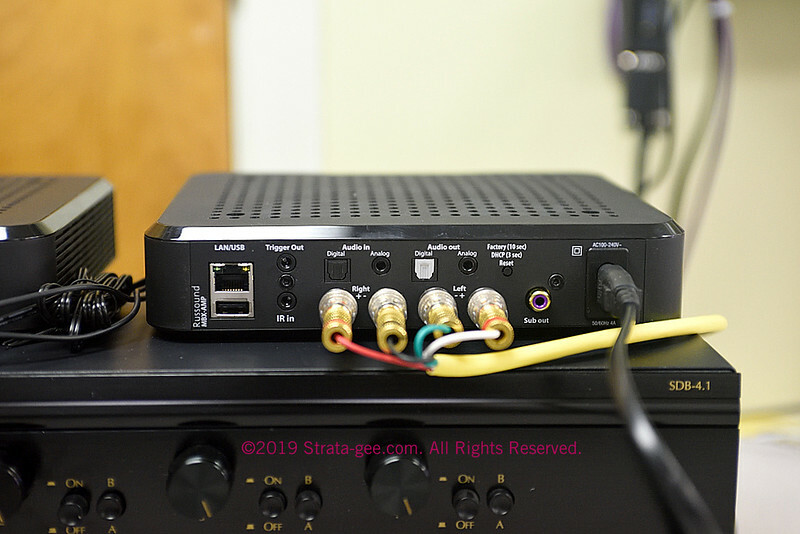 Clark told me that a popular application for the MBX Amp is to connect say a bedroom or den TV to the MBX-Amp and a pair of small bookshelf speakers for a major upgrade of your TV sound. It even has IR Learning so it can even learn the remote codes for your TVs volume up/down and mute for added convenience. And look at the picture below to see the long list of supported streaming services by the MBX series. All-in-all, strong offerings from Russound with products that are responsive to today’s trends. 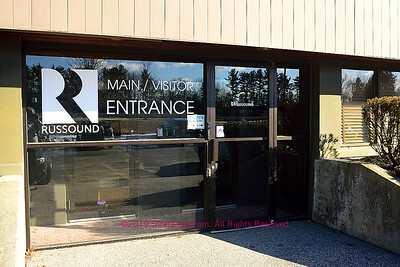 For more information on Russound and it’s full line-up, check out: www.russound.com.